Wildlife Protection Gravel Board Problem? Just Add an Angle Grinder! Gravel Board Problem? Just Add an Angle Grinder! A couple of months ago our nosy neighbour decided to replace our fence, yes, OUR fence. In fairness it needed doing, but rather than discuss it he just told us the day before that builders would be coming. Sadly, the replacement had solid gravel boards all the way along. But just add an angle grinder to the mix and your hogs have free access again! I managed to do this in situ - not easy and I'm sure in breach of many a health and safety best practice. So the hogs, frogs and toads can still get in the garden to the pond and veggie patch etc, but we also have a nice new fence. 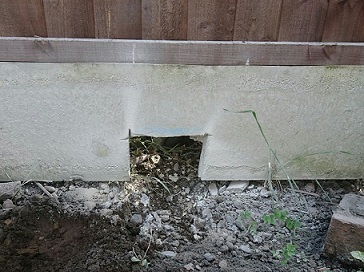 Concrete gravel boards don't have to be the scourge of garden wildlife. How long did it take you to do this David? To cut the board was no more than a ten minute job. I used my father in law's angle grinder which cut through quite easily. Some gravel boards are reinforced with steel so may need a pretty sturdy blade to cut through it! Nice one David. When I built a new fence in the garden I left spaces for the same reason, to allow Hedgehogs (and our cats) to have access. The most surprising thing was that I once watched a large Fox squeezing through one of the access holes; quite impressive seeing that the hole is only six inches square. That's brilliant Paul. Would love to see a fox in our garden. I've considered (for when I have a few quid spare) investing in a motion camera to set up overnight and see what visitors we get in.